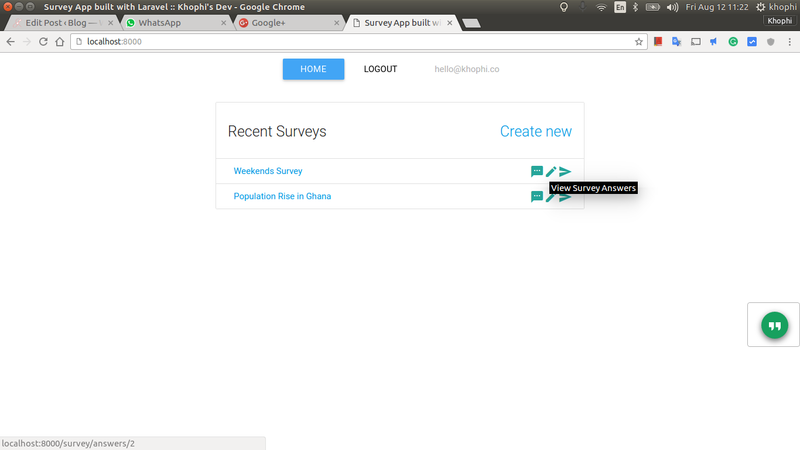 Your journey to build a Laravel Survey App begins from here. Relax and enjoy! Hello, everyone. As I explained in a separate post about how to Save JSON Objects into DB when using Laravel 5, PHP/Laravel has not been my strong suit, until a few days ago, when a job interview process required me to get up and running with Laravel, within 3 days. Learning how to use a new framework is not always an easy task to grapple with, especially considering what could be done in one programming language framework is easily achievable in the other too. With that in mind, there is not much sense in learning all the frameworks to exist under the sun. Django has been the Python Framework for the Web I have gone deep into and built applications in the name of it. My next affinity was with the Ionic Framework. Ionic Framework is primarily for building cross-platform, cross-device mobile apps, so in combo with Django which is designed for the web, I guess I wielded almost all the ‘Force’ I needed to overturn Darth Vader. The task at hand from my potential employers was to build a Laravel Survey App. I am someone who came in contact with PHP code only when I had to move around in my WordPress installations across servers, and didn’t have any interest in going into PHP, although I have a strong respect for the language behind Facebook and WordPress. PHP is ‘po-ha-phul’, I mean, Powerful! When I got the email, I thought, ‘Duh! This is easy!’ I was more than excited to impress my potential employers, so I set the goal of getting my hands dirty with Laravel and finishing the Laravel Survey app within the 3 days given me. In short, I couldn’t deliver within the 3 days given me when I took a closer look at what I needed to do. Laravel wasn’t a mere 2 line Framework. Like Django, it is a huge framework, with many moving parts. For example, for some time, I just kept calling insults on whoever developed the folder structure of a Laravel Project. As time went on, I realized the folder structure wasn’t in any way getting in my way, after I got used to where what was. Maybe the folder structure could be improved, but well, that’s a piece for another article. However, the generous employer gave me an extra 24 hours to get the basic moving parts up and running. I managed to concoct something up to submit, pushing in last commits 2 or 3 minutes before the deadline was up at 18:00 GMT i.e Greenwich Meridian Time, not the Ghana Man Time. Laravel makes life so much easier in certain aspects in Web development. For instance, front-facing authentication is a breeze in Laravel, although there’s a lack of Admin page which comes with Django. Unfortunately, Django lacks a front-facing auth mechanism. It appears a comparison between Django and Laravel might need to be a separate article on its own, however, Laravel comes with many simple additions that go a long way to ease a Web developer’s life. I spent 10 days eventually completing the Laravel Survey App. Each day of the ten days, I learned something fundamental about Laravel. In the process, I dig deeper into the why’s certain aspects are what they are. As much as I got deeper, many of the initially annoying parts of the framework made sense. I came to appreciate the heavy-lifting that happens behinds the scene, all in ‘Symfony’ (oh the irony) in getting my app completed and worked on with ease. As a developer, tools that let me get more out of my minimal available time is everything I can vote for. Django proved to be. Laravel is even great and simplifies life to a great extent. The 10 Days of Laravel series of articles are meant to share with anyone interested in getting started with Laravel to learn basic concepts and the fundamentals of Laravel and in the process get a complete Laravel Survey App up and running. Wield yourself with tips and tricks that could help you tackle your next big app using Laravel after gaining the basic understanding of how the Laravel framework works, and how to leverage the sweet ease-of-use it comes it. For Laravel newbies, I recommended following the 10 days of Laravel guide. The guide strives to cover as many concepts in Laravel and provides many useful tips in helping you get up and running with Laravel 5. Instead of 10 separate articles, I’ve merged them together into a single post. You can therefore print the page if you wanna take the article with you. And the source code is up now. Know a friend who wants to get started with Laravel, but on the right foot strong? Recommend this 10 Days of Laravel Guide. I wish you follow along with the series and all the best in your up-and-running’ness of Laravel 5!